After the sore breakup with Ritchie Blackmore in the 1990s, Deep Purple (now) sounds pretty much like a band that acts by consensus – they seem to do nothing that the majority don’t agree upon. 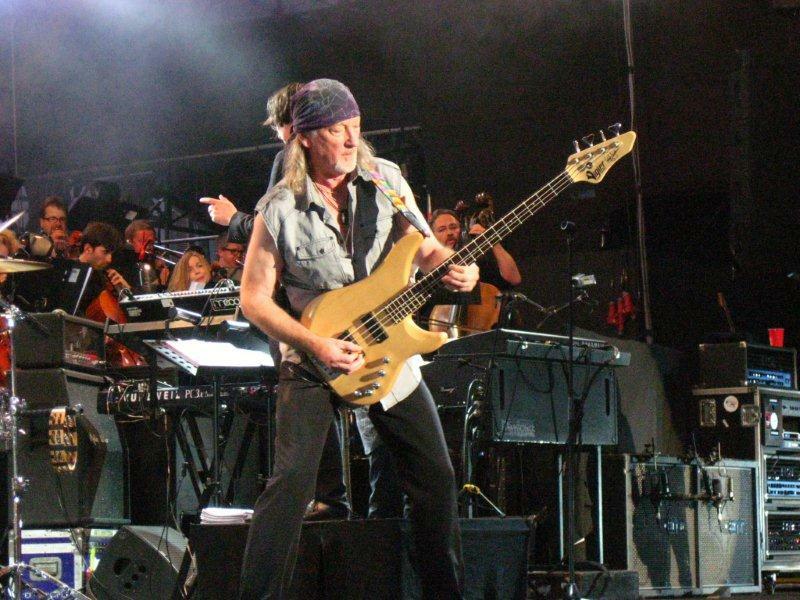 In a recent interview to a Canadian news agency, Roger Glover mentioned that there was no consensus within Deep Purple on the wisdom of cutting a new album. Many rock news sites interpreted that as a statement that they were still undecided, but in a subsequent interview Glover clarified: they had agreed, they got together in March to write, and they will go to studio late this year. It’s a fact that the bulk of the money for bands today is not in CDs anymore. It’s in tours, and the stage is the home for Deep Purple. Then, a wise man pondered that AC/DC sold huge volumes of their latest CD outing. Which is also a fact – in the overall sorry state of the phonographic industry, some albums still do fare well. Which brings me to some points about the current state of rock music. AC/DC are always willing to push for the audiovisual experience, while Deep Purple are happy to be five great players on stage. That’s much more honest than any kind of pyrotechnics, but it has a price in terms of marketing. AC/DC’s sales also got a ride in the publicity for the “Iron Man 2” movie. I can’t see Deep Purple signing with Marvel to tie their next record with the upcoming 2012 “Avengers” movie. In fact, if they did it I’d think it very strange! (Don’t get me wrong: I’m an avid comics reader, and one of my jobs is translating Marvel comics in Brazil. I’d love to see comics and Deep Purple join forces, but I just don’t see that happening due to the musical style of Deep Purple). I have had many an argument with Brazilian rock fans here who now say “Deep Purple again?” when they come here for a concert. A satirical website even published a story saying the band were going to get Brazilian citizenship to avoid facing the visa queues every time they visit (http://is.gd/EdTcAX – complete with a fake Brazilian passport with Gillan’s picture on!). Paulo, which attracted a multitude of people from all around the country. Another thing is persona. Deep Purple haven’t had myths built up around them. That’s one thing I discussed with Andre Forastieri, a magazine publisher who, as a music reporter, wrote the first DP concert review I ever read, on the 1991 tour. He pondered why Deep Purple never bothered having a consistent brand, a band logo, or cover art concept, or even a dress code (the fact that Ian Gillan uses the same t-shirt for two years doesn’t count!). Ozzy Osbourne, who’s as old as Purple, did a massive concert in São Paulo and sold scores of volumes of his biography. Ozzy basically uses his cartoonish persona and mythology to market his music. I took a teenage cousin there to watch the concert. Ozzy pointed foam hoses at the audience and so on. Silly, but very visual. Ian Gillan is a very personable and often funny entertainer – but he hardly would resort to such slapstick routines. something different if it’s shouting and flashing for their attention. And Deep Purple don’t beg, Deep Purple doesn’t play the game. Deep Purple suggests if one comes, if one searches, you will be musically well rewarded. The duh-duh-duh is easy to learn, but the tastiest parts of Deep Purple music come only after you get past the obvious bits. and the naked cellists and the wet-fantasy-girls of “Love Conquers All” (I must have missed that one! Ed). Let’s be serious. We’re talking about clumsy, half-hearted attempts while Gillan was on the band (and clumsy, but seriously taken attempts during the JLT watch!). The best Deep Purple videos to this day are the live DVDs where they let the music speak for itself. That’s what Deep Purple is about. image in today’s music, and he has no shame of doing a Michael Jacksonesque dance in the “Man in the Middle” vídeo, for example (you spotted it too! Ed). It’s part of show business: it’s tough to sell music alone. While Steve Morse pondered in a recent interview that trying new songs onstage would see them to go on YouTube immediately (so they don’t do it), David Coverdale reckoned putting the opening of “Love Will Set You Free” vídeo on YouTube got them a bigger audience than MTV in the 1980s. effort that I don’t see the majority of them agreeing to. That’s the cost of a democracy, anyway. Marcelo is based in Brazil. Maybe it’s true that if DP had decided to go more “visual” they would sell more, but, at the same time, they may lose some of those fans that go to their gigs basically for the music, not for the pyrotechnics. I would say DP is a band that has refused to do what the industry expects from music bands and, for example, their attitude towards the MTV and everything it symbolises is a clear indication of what I’m saying. Also, many critics basically ignore them because they are not “trendy” enough, but it is not less true that when DP did in the past what they were expected to do the results were not always great: far from it, in fact. So, in the end, given that DP no longer need to prove anything to anybody, they have decided to continue doing whatever they want to and that’s about it. As for the setlist, again, maybe it’s true that at times it may sound repetitive, but, taking the AC/DC example, they have kept the same setlist, without virtually any changes, for a whole tour, and the vast majority of shows have been sold-outs all the same. In fact, I would say Ritchie Blackmore’s final years certainly were quite formulaic, but for the last 20 years now DP have been doing an attempt to keep the “indispensables” just as they incorporate either new stuff or play again older stuff they hadn’t played for years. And, as usual, what would people if, for variety’s sake, DP decided not to play Black Night, or Perfect Strangers, or Lazy, or… (you name it)? Many fans would complain, for sure. Given that they are not going to play 3-h gigs, the compromise they have come to is fair enough. I’m with Jeff. We/they need to change the stage/set idea. Long instrumentals, real live interaction, improvisation, sudden changes in the structure of songs. Those used to be their trademarks, but our loved musicians seem to have forgotten it all. We the fans would prefer a show for just one thousand people who really love the band and its way of performing music. We’re not interested in 30.000 fans shouting at the NEC for Smoke On The Water. But they seem to believe that to get a big crowd is the only way to survive… and they are wrong. Part of it is taking chances and they just don’t do that anymore. Ian Paice is an amazing drummer but when is the last time you heard him bring out a drum beat that plays a dominant role rather than a supportive role? Why can’t he do more like he did with “You fool no one?” On “Burn” and “Come Taste the Band” Paice was just on fire. I think if he were more aggressive, the band would become more progressive. I understand that one becomes more refined as a player with age, and looks to serve the song/music. I would like to see the band play extended songs, and maybe a few instrumentals. They have almost become formulaic in a Purple sort of way. Let Don Airey fly and don’t base the material on what Gillan can sing over… challenge him too sing over absurd stuff like in the early days. But doing the same set list over and over and over again in the last 20 years or so is not very honest I think. Ok the songs are great but, why they don´t change some of that list? They just play 2 or 3 songs from Morse era I mean what is this, there´s albums like Who do we think…, House of Blue Light, Battle Rages On, and all of them are denied by purple (or Gillan must i say?). So, it´s not a matter of honesty, it´s a matter of comfort for Purple and the people are bored of the same thing all through these years.